Why make your own yogurt? Isn't it easier to pop into a supermarket and buy a couple of cartons? Have you ever read the ingredients label on a store bought yogurt? Homemade means it only has milk and culture. No nasty stabilisers, sugar, gums or artificial flavours. Nutritionally, you are in full control. Homemade means doing your bit for the environment - no need to recycle those little plastic containers with the plastic spoons. 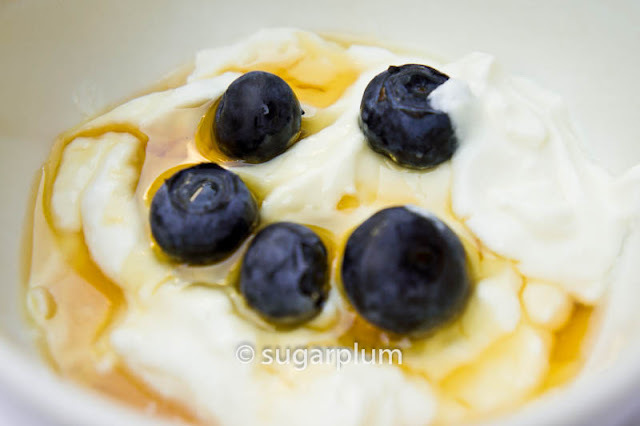 Homemade means cheaper grocery bills - have you seen how much imported yogurt costs here? Not being a snob here, but local yogurt is too sour and runny for my liking, plus they mostly leave a funny grainy texture in your mouth. 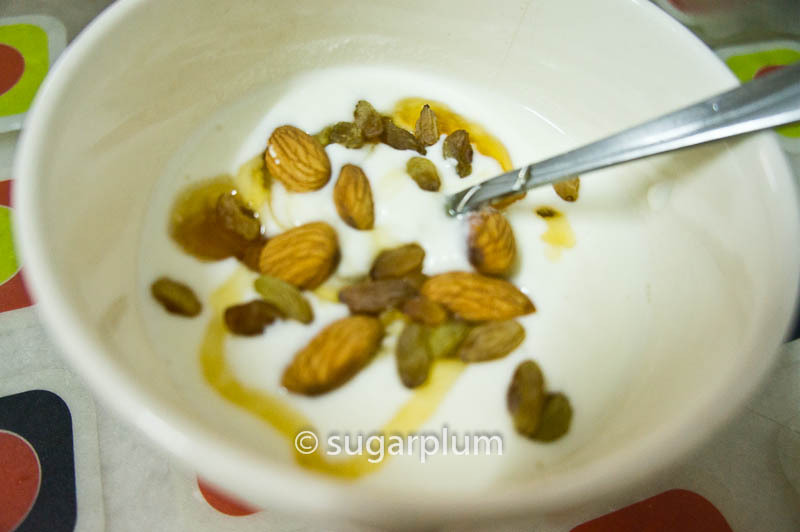 Homemade yogurt is milder than the store variety and you get to control how tart or mild you like your yogurt. I found that 6 - 8 hours of incubation is good enough to produce a mild yogurt. 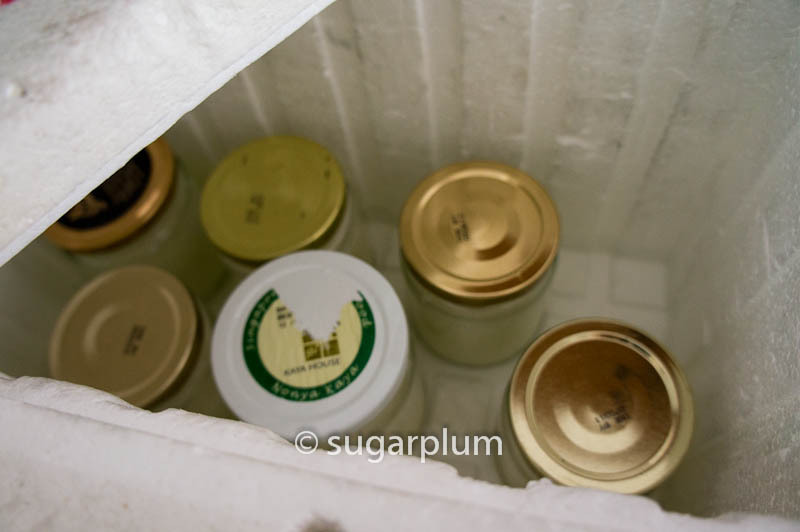 I confess to being a little paranoid over the food safety aspects the first time I made yogurt, and this post walks you through it. 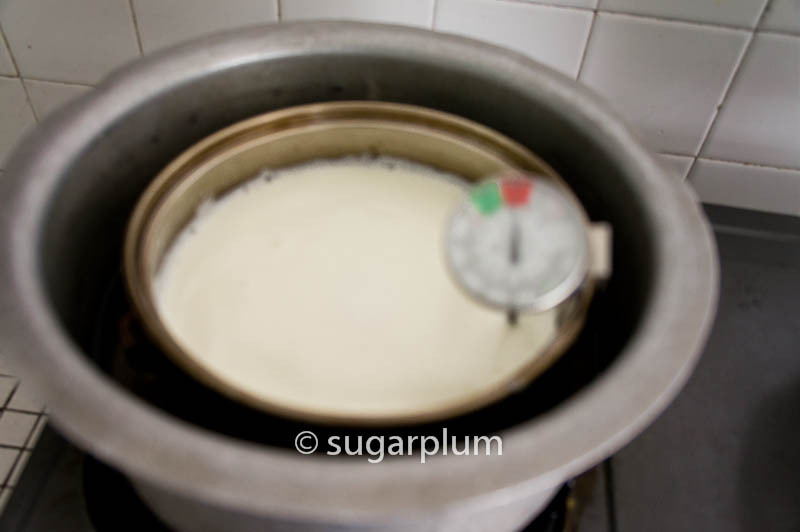 However, it appears that if you live in the tropics (like I do), it's as simple as just heating up the milk, stirring the starter in and leaving the entire mix to incubate at room temperature. My Indian friend very kindly set me right. Indian mamas have been producing yogurts in their kitchens for generations, using nothing more than milk, culture and a pot! 1. Use milk as fresh as possible, or pasteurised. Full cream gives a thicker richer yogurt, while low-fat will be runnier. You can boost low-fat milk with dry milk powder to give it more body if you like. 2. Scald the milk. This is to denature the milk proteins so that you get a firmer set, and gets rid of competing bacteria so that the yogurt culture can go forth and multiply. Don't boil the milk because your yogurt won't set. 3. Use the freshest starter yogurts that say “live culture” ie not towards end of shelf-life. This ensures there are plenty of good bacteria to turn the milk into yogurt. 4. Resist the temptation of adding more yogurt starter. More starter must mean more nutrition, right? Nope. Too much and you'll end up with watery fermented milk. Imagine all that bacteria fighting for a space to live in - bacteria also like a nice comfortable living area, not slums. 2 tablespoons for every 1 litre of milk is good ratio. 5. There’s a narrow range of temperature for the bacteria to flourish and multiply. Like Goldilocks, too hot and you kill them. Too cold and they go to sleep, zzzz. It needs to be just right; 90F – 120F (32-49C) is about ideal for those little buggers to thrive and do their work. 6. Incubate anywhere between 4 - 12 hours. The longer you incubate, the tarter and firmer it gets. 7. I encourage using a thermometer the first few times you try this out, so that you get a feel of what it should be. After that, do as Indian mamas do - visual all the way. 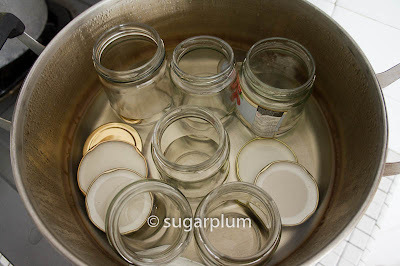 The method I've used so far includes sterilising the jars and utensils. You may choose to skip this step if you wish. my version of double-boil milk. visual for milk heated to 185-190F. See the tiny little bubbles and foam on top? 1. Using clean jars and lids, place them into a pot with about an inch of cold water and bring to boil. Cover with a lid and boil gently for 10 minutes before removing from heat. Leave the pot covered until you are ready to use. 2. Heat the milk to 185-190 F(85-90 C). 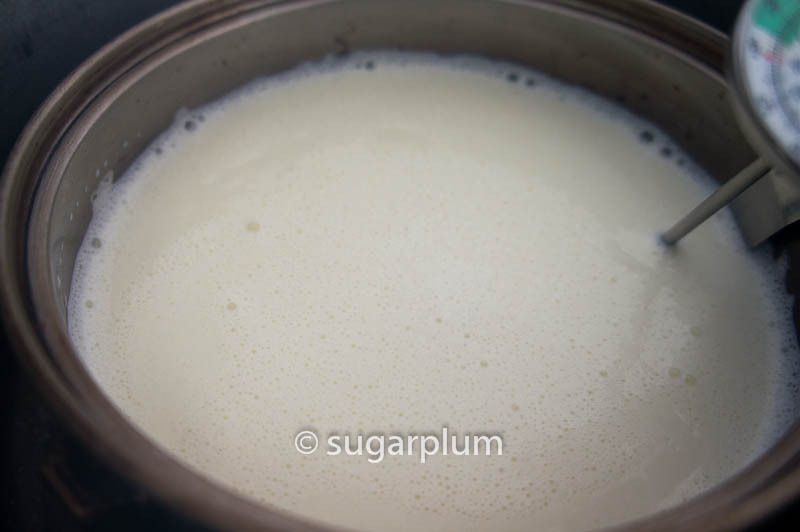 Be careful not to let the milk burn at the bottom, so stir, stir, stir. I actually double boiled the milk to ensure that it wouldn't burn. Use a thermometer if you have one. I stuck it into the boiling water to sterilise it before sticking it into the milk pot. If you don't have a thermometer, visually, the milk will be at 'steaming' stage. It will be foamy and almost velvety, like the top of a flat white. Keep it at this stage for about 5 minutes or so. Then remove from heat. 3. Let the milk cool down to 90F - 110F (32-43C). Without a thermometer, this is about the passing the 'ouch' test : being able to hold the pot for more than a few seconds with bare hands, or drip a bit of milk onto your wrist. 4. Stir the yogurt starter with a bit of the warm milk to loosen it up. Then stir the starter into the pot of milk. Stir well to ensure that the starter is evenly distributed, otherwise you may end up with different textures in each jar! 5. Remove the jars and lids from the earlier pot. Pour the milk+starter into the jars and lid them. 6. Place the jars in a warm environment for 6 - 10 hours or overnight to incubate. I placed them into a cooler box. Remember the pot of hot water from the jar sterilisation? If it is between 90F - 120F (32 - 49C), pour the water into the cooler box - this will ensure your box is warm enough for the jars to incubate. Close the box, cover with a towel if you prefer, put a "Do Not Disturb"sign and come back later. The yogurt will look a little soft when the time is up. Don't worry, it just needs to be chilled to firm up. 7. Remove the jars and keep them in the fridge to further set and firm the yogurt. 8. You may see some yellowish liqud separation in the jars - this is the whey. Highly nutritious. If you don't fancy it with your yogurt, just pour it away and use it for making breads, pancakes etc. 9. Serve with some honey and fresh fruit or muesli. You can use any non-metal containers to hold the yogurt. Glass or porcelain are best. You can see that I used an assortment of recyled jam and honey jars. Use wider-mouth jars or containers as it is easier to pour in/out. I like the results best when I cool the milk to 100F and incubate for 6 hours. Do stir the yogurt starter thoroughly into the milk. The first time I made it, it must have been uneven because I ended up with 5 jars perfectly set and 1 that still looked and smelled like milk. I discarded that. 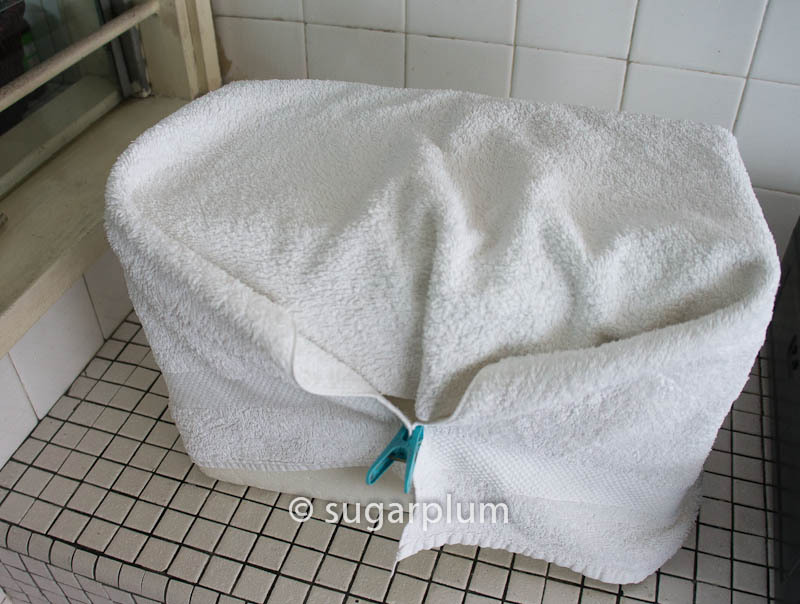 If you like a thicker, Greek-style yogurt, just strain the yogurt using a cheesecloth or coffee filter. Strain the yogurt in the fridge for about 3 hours or overnight and voila. 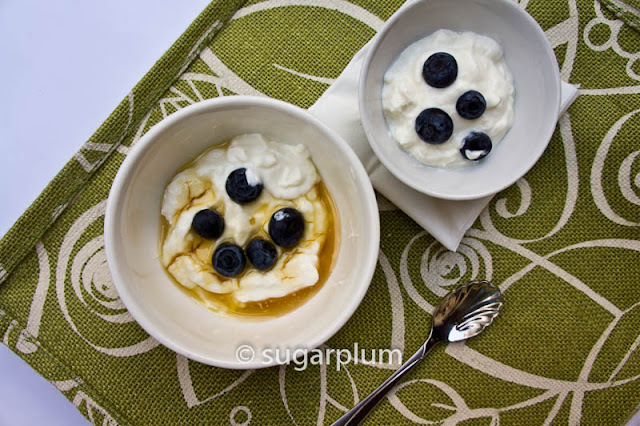 Greek-style yogurt without paying a premium for it. 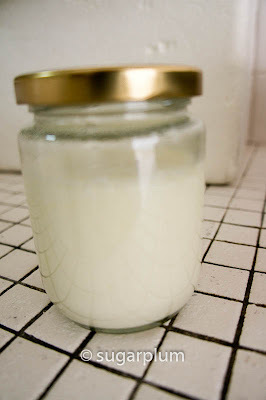 I've a friend who uses raw milk and kefir grains to make yogurt and it's very cost effective as the kefir grains grows very fast and it's reusable. It apparently eats up lactose as well so the yogurt is great for the lactose intolerant too! Kefir? Haven't heard of that ingredient. Must check it out. Maybe I should see if the Indian man still delivers fresh raw milk on his bike. We used to drink those. Apparently yogurt in general is suitable for lactose-intolerant people. The bacteria eats up the lactose and converts the milk into yogurt.